I am addicted to all things buffalo chicken. And, who doesn't love potato skins? I decided to combine two of my favorites into one fabulous recipe. 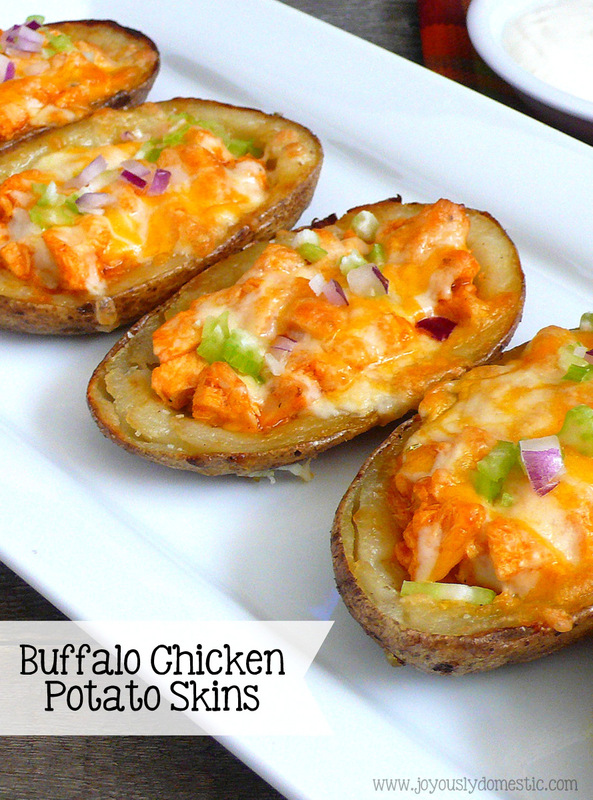 These are not overly spicy, but are zippy enough to please all of the buffalo chicken lovers in your house! Yields 4 servings (8 potato skin halves). Preheat oven to 400 degrees. Bake potatoes about one hour or until they are cooked through. Alternately, you could cook potatoes in the microwave until cooked through. Allow potatoes to cool, then cut in half. Scoop out the center flesh - leaving a little along the edges. (Reserve inside flesh for another use if desired.) Place potatoes onto a parchment paper or foil-lined baking pan. Brush both the inside and outside of hollowed-out potato with oil. Season insides with salt and pepper. Bake for 8 - 10 minutes on each side or until just starting to crisp. Meanwhile, combine the melted butter and hot sauce in a medium bowl. Stir in the chicken to coat. Once potato skins have crisped on both sides, remove from oven. Turn oven to broil. Evenly distribute the cream cheese between the potato skins by placing a few small pieces into the bottom of each potato. Distribute the coated chicken between the skins - layering it on top of the cream cheese. Top each skin with a little shredded cheese and bleu cheese (if using). Broil skins for a few minutes until cheese is melted and bubbly. Serve while hot with chopped celery and onion for garnish. Serve with bleu cheese or ranch dressing.